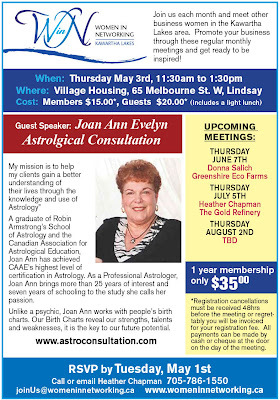 Our May WiN meeting is this Thursday, May 3rd and our guest speaker is Joan-Ann Evelyn of Astrological Consultations. Joan-Ann has been a guest speaker of ours for a number of years now and we are very happy that she can join us again this week! Please let me know by this Tuesday if you will be attending. Full details below. Please note that we will be meeting at our new location: The Village Housing at 65 Melbourne St. W., Lindsay. You can view their website at CommunityCare or map directions here. I look forward to seeing everyone this Thursday. If you have any questions please let me know. This is a FREE INFORMATION MEETING you cannot afford to miss. 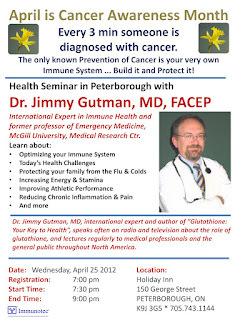 I don’t know anyone who does not know someone Proactive and into Prevention with their health or seriously ill. Why not at least take advantage of this rare opportunity to hear from DR GUTMAN, FACEP himself. DR GUTMAN, FACEP is a board-certified emergency physician, now practicing family medicine. He received his training at the University of Calgary and took up his residency in emergency medicine at Emory University in Atlanta,GA where he was chief resident. Upon his return to Canada he eventually became Undergraduate Director and Residency Training Director of Emergency Medicine at McGill University in Montreal. If you are unable to attend, but know someone that would like to come, please pass on the message. Due to limited seating please let me know if you or someone else is able to attend and I will register your seats. Just ask for me when you arrive and I will make sure you are looked after. Hello ladies and happy Spring! Thank you to all for your patience. It has been a busy few months looking for a new location to hold our WiN meetings and I am very excited to say that I have found the perfect spot... starting next month (May 3rd). For this week only we will be back at our old stomping grounds, downstairs at the Queen St United Church (map) where I will share all of the details about our new location and upcoming meetings! Please let me know asap if you will be attending this weeks meeting. 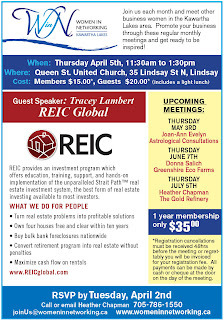 Our guest speaker is Tracey Lambert of REIC Global, full details below. 10. Twila DelFatti - Silver Connections Inc.